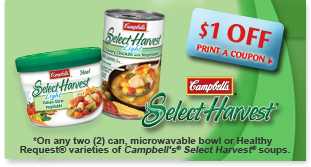 All Campbell’s® Select Harvest® soups are made with delicious ingredients like farm-grown vegetables and roasted natural white meat chicken, and contain absolutely no artificial flavors of any kind. Nutrition & Wellness: How Does Your Family Lead Balanced Lives? Keeping your life in balance can be especially hard in winter. We want to know what your favorite winter sports are. Select Harvest® Soup Pairings - What?s for Dinner? ChicNSavvy: What Came in Your Mailbox Today?! I really enjoy the new Campbell’s® Select Harvest® Soup line that contains that no artificial flavors, color or preservatives. We’re excited to announce the winner of our "How do you live a balanced life?" contest. The winner is Stephanie, a mother to a very active one year old! Stephanie will be receiving a year’s supply of Campbell’s® Select Harvest® Soup and a Wii Fit as her prize!